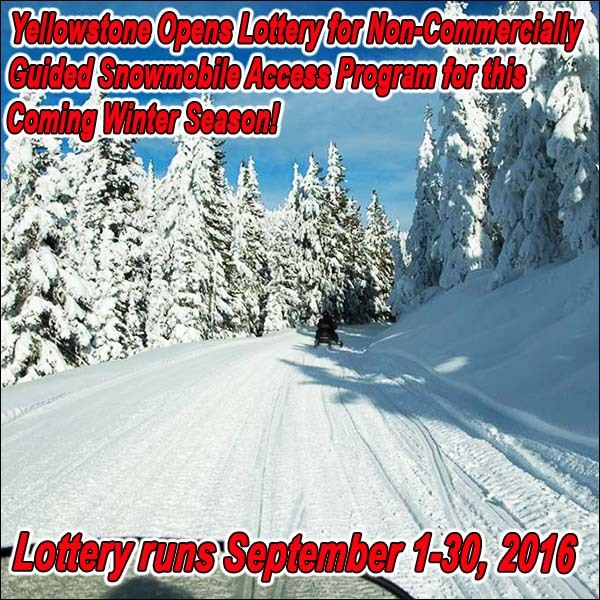 Yellowstone Opens Lottery for Non-Commercially Guided Snowmobile Access Program for this Coming Winter Season! Applications will be accepted starting Thursday, September 1, for those interested in obtaining a permit for a non-commercially guided snowmobile trip into Yellowstone National Park during the 2016-2017 winter season. A permit is required for all non-commercially guided snowmobile groups to enter the park. Permits will be allocated through a lottery with applications being accepted online at www.recreation.gov through September 30, 2016. Successful lottery applicants will be notified in mid-October. After the conclusion of the lottery, any remaining or cancelled permits will be available on a first-come, first-serve basis through the same webpage starting in November and going through the end of the winter season. Trips can be up to three days in length, and permits cost $40 per day, with a $6 application fee. The Non-Commercially Guided Snowmobile Access Program was authorized in the 2013 final Winter Use Rule. The program allows one non-commercially guided group per day to enter Yellowstone from each of its four winter entrances. A maximum of five snowmobiles are permitted in each group and all snowmobiles must meet the park’s New Best Available Technology (BAT) standard. A list of approved snowmobiles is available at www.nps.gov/yell/learn/management/newbatlist.htm. Permit holders are considered non-commercial guides and must be at least 18 years old by the first day of the trip. All snowmobile operators in a non-commercially guided trip must possess a state-issued driver’s license and have successfully completed the free online Yellowstone Snowmobile Education Certification program. Anyone can take the course to learn more about park rules and regulations that help visitors safely enjoy the unique experience of winter in Yellowstone while also protecting park resources. Go to http://provalenslearning.com/yellowstone-snowmobile-education-certificate. The development of the Non-Commercially Guided Snowmobile Access Program has had significant stakeholder involvement. In particular, the State of Wyoming, through the Governor’s Office and the State Trails Program, has provided critical support for the development and maintenance of the required online snowmobile education course. Additional details regarding the program, including specific rules and regulations in place for non-commercially guided trips, can be found at www.nps.gov/yell/parkmgmt/ngsap.htm or by contacting Ivan Kowski, Non-Commercially Guided Snowmobile Access Program Coordinator, at ivan_kowski@nps.gov or 307-344-2165. For additional information on the Yellowstone Winter Use issue, visit our dedicated website www.saveyellowstonepark.com.